The third Vietnam Junior Fashion Week will be held at Gamuda Gardens in Hanoi on June 16-18. The event will present to audiences summer collections featuring more than 400 designs for children, including “12 zodiac signs” by Phuong Nguyen Silk, the “No 2 – Dreaming “ by Thao Nguyen, “Summer Fun” by Rue Des Chat, “The Summer Fairy” by Nguyen Lan Chi, “Dream Girl” by Tran Thanh Man, “Summer bright sun” by Rabity, “Kendo” by Kelly Bui, “The shapes of flowers” by Le Chau Kha and a collection by Do Manh Cuong. 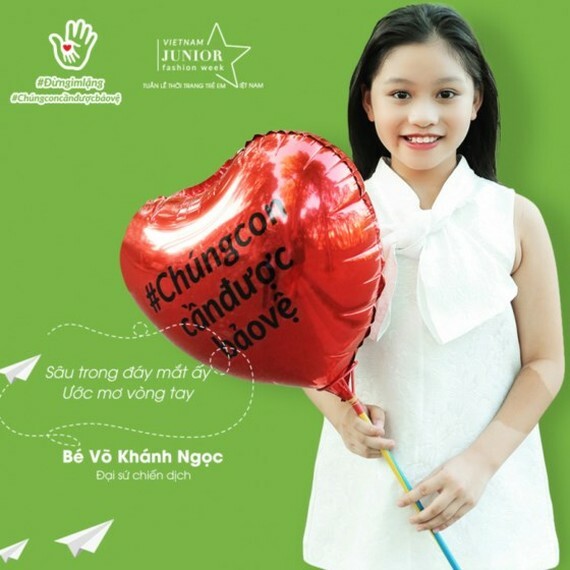 The event will attract 400 child models with the participation of actress Truong Quynh Anh, singers Tim and Vo Khanh Ngoc. Cho con tuoi tho (Giving our children childhood) written by musician Phuong Uyen is chosen as the theme song of the show. The work is performed by many artists, namely Meritorious Artist Thanh Loc, dancer Linh Nga, journalist Chu Minh Vu, The first runner-up of Miss Universe Vietnam 2015 Le Hang, Second runner up of Miss Vietnam 2016 pageant Thuy Dung, singers Hoang Bach, Pham Anh Khoa, Quoc Thien, Thanh Duy, Ai Phuong and more. It is also selected as the theme song of the "Dung im lang-Chung con can duoc bao ve" (Don’t be silent-We need to be protected) campaign.